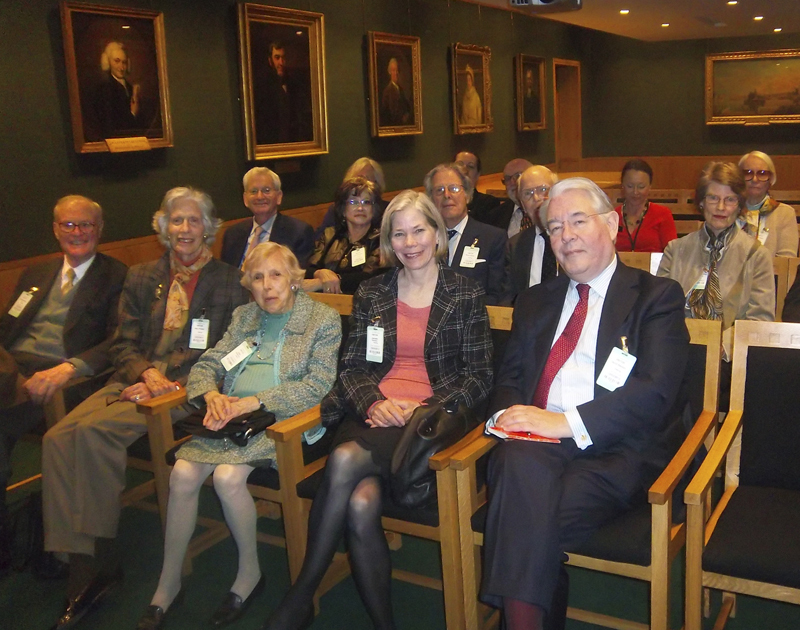 The 2012 annual ATBL Chairman’s Council trip to London was held in early March to allow participants to view the magnificent exhibition Royal Manuscripts: The Genius of Illumination before it closed. Opened by the Queen and the Duke of Edinburgh in a signature event of the Jubilee Year, Manuscripts offered a splendid visual insight into how the royals worshipped, governed and played over the past centuries. BL curator Scot McKendrick briefed CC members on the exhibit and introduced them to the ATBL-sponsored interns who helped put the exhibit catalogue online. The trip started with an evening cocktail party at the home of Trustee Ruth Robinson where BL staffers, American residents in London and ATBL donors renewed friendships. Next day the BL hosted a series of viewings and talks. 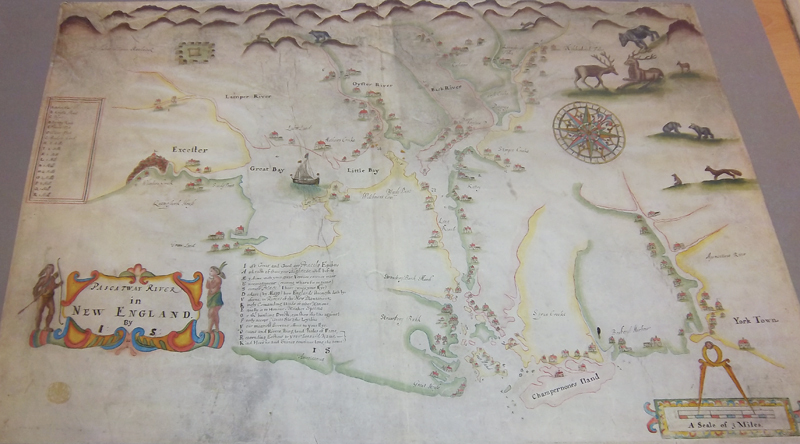 Curator Peter Barber brought out millions of dollars’ worth of maps, including the earliest views of Manhattan and a preview of what will be traveling to the United States. Members listen to Baroness Blackstone. Baroness Blackstone greeted guests and gave a progress report on the successes and challenges the Library faces. Dame Lynne joined members for lunch and members bid a fond farewell to this extraordinary woman who has led the Library so well for the past twelve years. After Scot McKendrik’s briefing on the exhibit, the members toured the show and bought the substantial catalogue as a memento. Following the tour, John Heald, Vice Chairman of the Sir John Betjeman Society gave us a talk on the poet and played Sir John speaking and reciting some of his pastoral poetry. 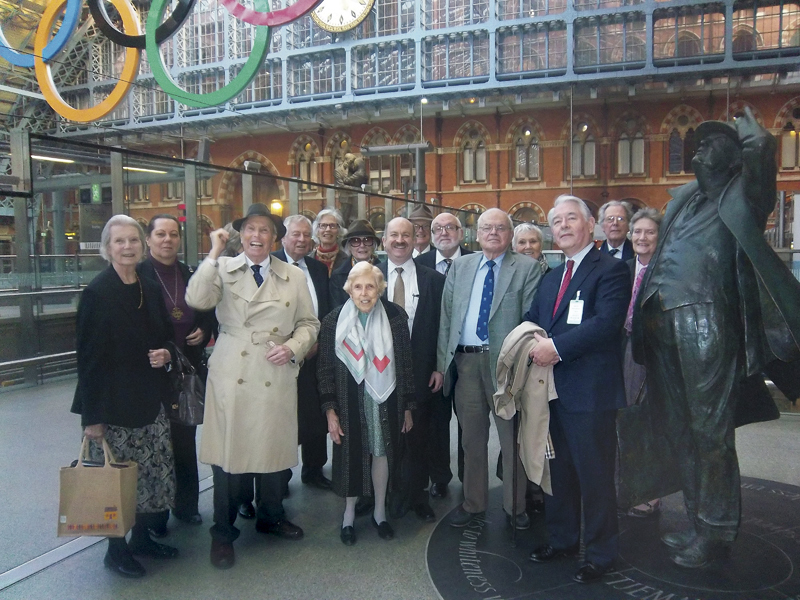 Mr. Heald then led us over to the St. Pancras Station to view the Betjeman statue erected to thank Sir John for his efforts in saving the Station. Members then had tea at the St. Pancras Renaissance Hotel, whose matching brick facade the BL mirrors. The Friends of the British Library, the parallel group in England, invited the members to an evening lecture by the Bishop of London on “Common Prayer, Culture and the Challenge of the Digital Age.” Christopher Wright, Deputy Chairman of the Friends, was our very gracious host and invited us to stay for the reception afterwards. Early Tuesday morning participants boarded a luxury coach for breakfast during the trip to Petworth House and Gardens. Petworth is a magnificent 17th-century National Trust mansion in Sussex, set in a beautiful deer park, landscaped by Capability Brown. Inside, the house contains the National Trust’s finest collection of paintings, with numerous works by Turner, Van Dyke, Reynolds and Blake, ancient and neo-classical sculpture, fine furniture and carvings by Grinling Gibbons. “Turner Studio” in private library at Petworth House. 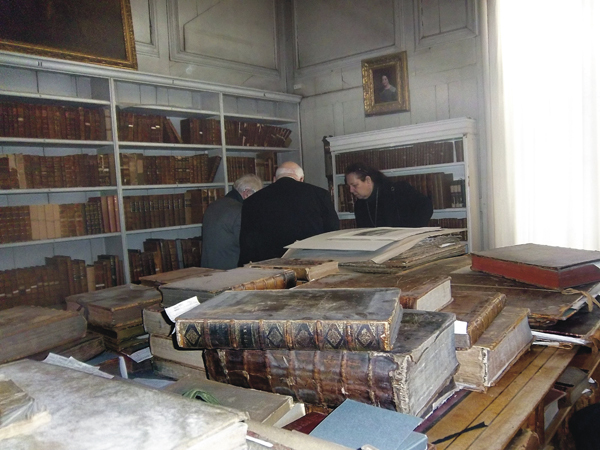 Members were allowed to see the private library where Turner painted and Lord Egrement, whose family is in residence, invited us to visit him in his private rooms. Members had lunch in the Café in the servant’s quarters which contains fascinating kitchens, including a copper batterie de cuisine of more than 1,000 pieces. 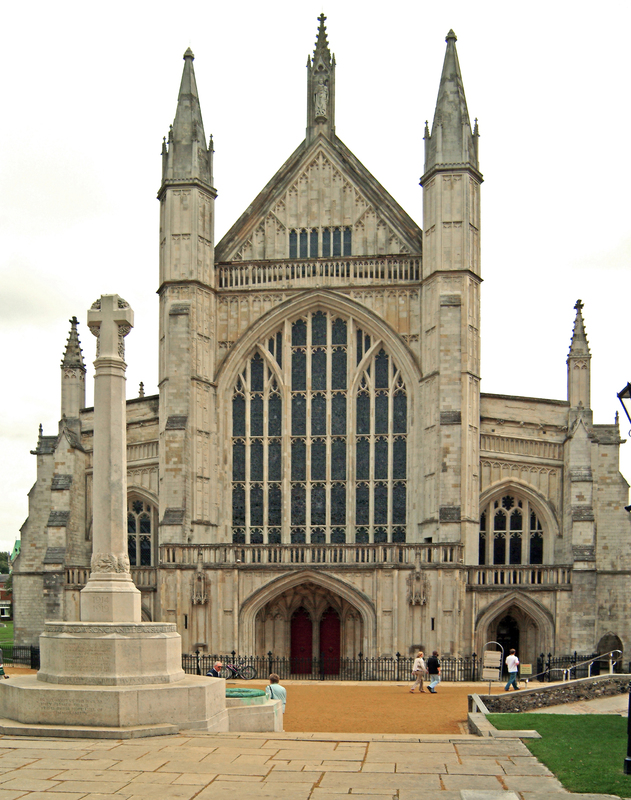 Members spent the afternoon in Winchester, first at a tour of Winchester Cathedral and Library where arguably the finest treasure in England is housed, The Winchester Bible. This is the largest and finest of all surviving 12th century English bibles commissioned in 1160, probably by Henry of Blois, grandson of William the Conqueror. Half of the group stayed at the Cathedral to view the crypt, relics and monuments and to hear Evensong. Dodie Armstrong arranged for the other half to visit Winchester College Library where Dr. Geoffrey Day, Eccles Librarian, displayed first folios of Shakespeare and the entire collection of Trollope. The Eccles Room is housed in what was the barrel store for the Brewery. It was opened in 1994 as a Fellow’s Library teaching room, having been refurbished by the generosity of Viscount Eccles, Simon Eccles’s father, who gave his collection of private press books. The room now houses English literature, Mathematics and Science texts, like Newton’s Principia and Hooke’s Micrographia. The Lord-Lieutenant of Hampshire, Mary Fagen, and her Deputy Lieutenant, Damon de Lazlo, grandson of painter Philip de Lazlo, hosted a splendid reception that evening for the members prior to their returning to London. Wednesday, the members had lunch at Sotheby’s hosted delightfully by Christopher de Hamel, Fellow Librarian of Corpus Christi College, Cambridge. All agreed that this Chairman’s Council trip was indeed memorable.